The Reggio Emilia approach to education views the classroom environment as the third teacher which should be a reflection of the children, parents, and teachers. It is imperative the environment is thoughtful, imaginative, and enticing to the child. Research has long shown a correlation between the classroom environment and children’s behavior. In the article, Creating Environments that Reduce Children’s Stress, Sony Vasandini specifically focuses on the cortisol levels of children in preschool and home settings. Cortisol is known as the “stress hormone.” Children naturally have lower cortisol levels in home environments, but these levels increase throughout the day in preschool settings, depending on how nurturing and comfortable the environment is for the child. Since research has ruled out children’s separation from parents as being a cause of this rise in cortisol levels, it is now important to look at the classroom environment as a factor for causing stress. How do we ensure a learning environment that promotes positive behavior and lower stress levels in children? Focusing on the noise, color, lighting, temperature, and physical space in the classroom is key to ensuring this takes place. Studies have found a relationship between noise, reading deficits, and cognition. Ultimately, as a classroom environment becomes louder, there is a greater chance for a reading deficit and a lower level of cognition. One study focused specifically on background noise and reverberation, and it explains that young children need low background noise and very low reverberation time levels in order to perceive speech at optimal levels. Establishing classroom rules, speaking in a normal volume, teaching children how to quietly get a teacher’s attention, and making sure that children are given plenty of attention are several suggestions on how to promote appropriate noise levels. Ensuring classrooms have areas for small group activities will aid in noise control and crowding, a problem which lowers motivation levels in children. Another way stress can be reduced in young children is ensuring the bond between a child and their teacher is strong. If a child has a great relationship with their teacher, the teacher will be able to act as a guide for the child to develop language, social skills, and self-esteem. These bonds cannot be created over-night, but the longer the same teacher is working with a child, a stronger level of trust can be created. As a level of trust is established, the child will become more comfortable in the classroom environment, which can then help reduce the child’s stress in the classroom. 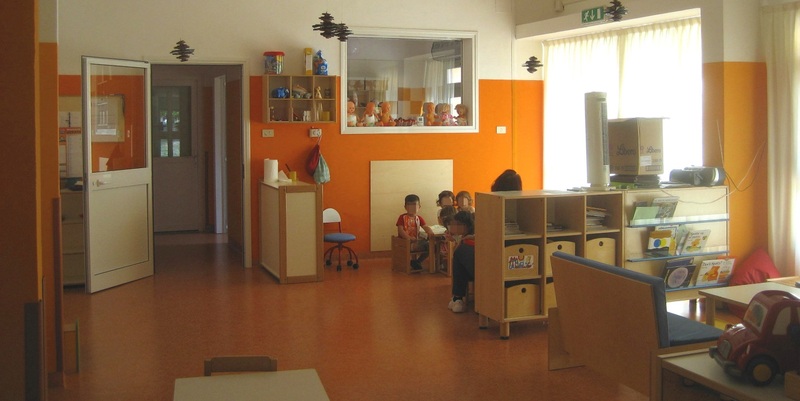 Colors in the classroom have been shown to have an effect on children’s cooperative behavior. Colors should be neutral so overstimulation does not occur. Lighting in the classroom should be as natural as possible to promote children’s overall health and well-being. For example, fluorescent lighting has been shown to have a negative impact on children’s health and work performance because its brightness makes other colors duller. Also, flickering fluorescent lighting can cause fatigue and the straining of the eyes. In order to improve a child’s focus in the classroom, the temperature should be at a comfortable level, between 68 and 70 degrees Fahrenheit, as temperatures that are much higher or lower will make children uncomfortable and harder to focus their attention. It is also crucial that the environment promotes socialization among children and teachers, as well as interaction with materials. This can be accomplished by strategically placing current and past projects throughout the classroom, as well as placing other decorations at various heights. It is crucial for the classroom to remain open and clutter free so children have the ability to move around while exploring and collaborating with one another. Incorporating some of these ideas and suggestions is a sure way to promote appropriate behavior, growth, learning, and stress management for children. It is also important to be mindful in the amount of stimulation, as overstimulation can quickly lead to an increase in stress for children. The classroom setting should allow for children to make sense of the world they live in. According to Vasandani, “an aesthetically-pleasing environment helps children feel secure and relaxed, reducing stress levels to enable their healthy holistic development and the development of positive behaviors”. Tying together the Reggio Emilia approach with the ideas surrounding this article, both value and promote an environment that is conducive to learning by supporting the idea that children should be given the correct tools to guide them on their own paths of learning and discovery.